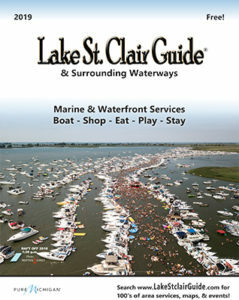 The Lake St. Clair Guide provides directories for “Services in Chesterfield Township” Macomb County for boat and marine. The Chesterfield Township area offers many options for marinas! Also many brand certified engine and marine services are here on and around the water. 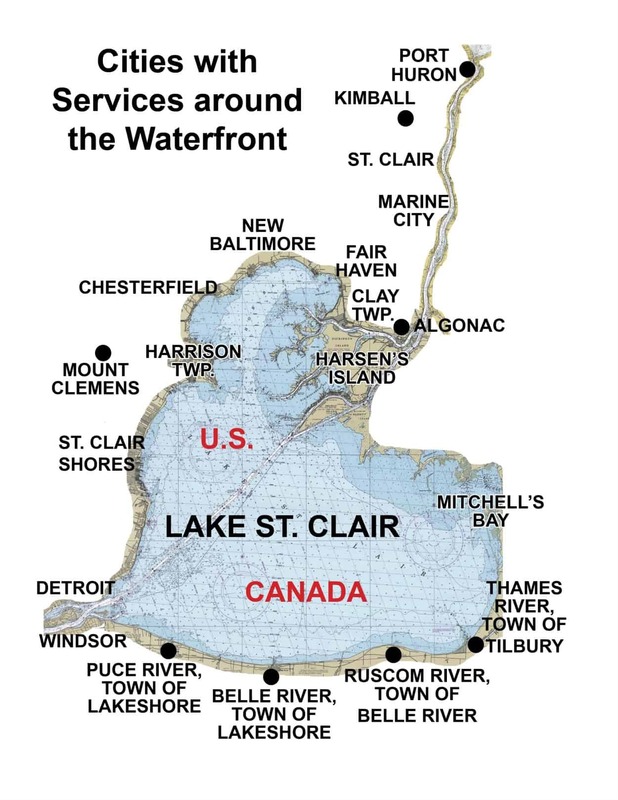 “ZOOM in” on our interactive Lake St. Clair maps for detailed satellite water entrances & basins to help guide you into these Lake St. Clair boat marine Chesterfield Township area services! 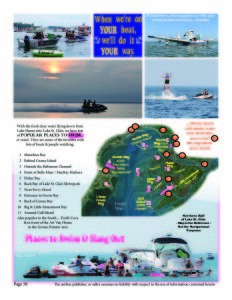 Anglers Point Marina Chesterfield Township is located across from the Selfridge DNR Launch Ramp. We sell bait and fishing licenses, have fishing boat rentals, a fuel dock, & vacation rental with boat well for visiting fishermen, and are open year round for ice fishing too! CJ Browns Boatyard Grille – Chesterfield Twp. 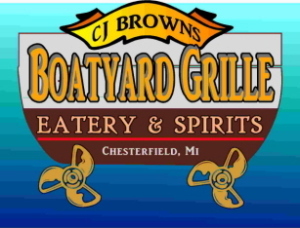 CJ Browns Boatyard Grille is located on Jefferson in Chesterfield Township. We are walking distance from several marinas… or stop by via car on the way home from your marina! We offer specialties of Detroit style Pizza, ribs, chicken, and Lake Perch. L & M Marine Service and marina offers boat wells starting at $900 on the Salt River just off Lake St. Clair. We also offer a variety of services including shrink wrap, winterizing, detailing, and storage. Marine Services include: Electronics installation, air conditioning, generators, alarm systems, bow thrusters, water makers, video/audio, marine toilets. Marine One Construction – Chesterfield Twp. Marine One Construction is fully equipped to build and repair your seawalls, boat hoists, docks. Our equipment can take care of dredging, piling, bridges, and marine salvage on Lake St. Clair in Macomb County. North Bay Marine – Chesterfield Twp. North Bay Marine sales, service, and repair of boat Engine / Outdrives / Transmission by Lake St. Clair. Authorized dealer for MerCruiser, Mercury, Mariner, Verado, OMC, Volvo Penta. PGA Collision – Chesterfield Twp. PGA Collision provides marine, RV, auto, & PWC structural & cosmetic repairs, custom gel coat matching – fiberglass, paint, carpentry. 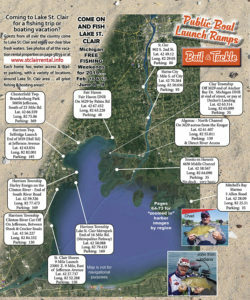 We are located on Lake St. Clair in Macomb County, with boat access on the Salt River. Just off Lake St. Clair’s beautiful Anchor Bay in Chesterfield Township, Propeller Basin Full Service Marina is conveniently located only a few minutes off I-94. SASH GRAPHICS – Whether you or your organization needs custom t-shirts, polos, hats, bags, promo items or vinyl graphics/decals – we’re your one stop source. Sportsmen’s Direct is open WINTER & SUMMER 7 days a week! Live bait, large tackle selection, fishing licenses, ice, drinks & snacks, knowledgeable staff, free fishing seminars. Sun-Up Marina – Chesterfield Twp. Sun-Up Marina is located on the Salt River on Anchor Bay, just off of Lake St. Clair. Everything you’ll need is right here! Marina, fuel dock, party store, bait, marine supplies, restaurant and carry outs within walking distance, club house, picnic areas, and more.